2010 Cheltenham Gold Cup winner Imperial Commander has been ruled out of the Betfair Chase this weekend due to injury. The 11-year-old burst a blood vessel in the 2011 Gold Cup and hasn’t been able to race since. There had been hope that the long awaited comeback would happen at Haydock this weekend, but trainer Nigel Twiston-Davies revealed that, although not serious, the latest injury setback has cost Imperial Commander a place in the Betfair Chase. Twiston-Davies said: “It's nothing dramatic, but he won't be in full work for around six weeks. It's disappointing but these things happen. 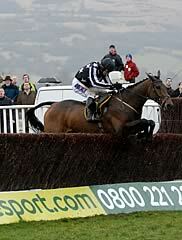 In Imperial Commander’s absence 2011 Gold Cup winner Long Run is the favourite for Saturday’s race. The Nicky Henderson trained horse is the one to beat at Haydock this weekend, but Betfair have revealed fascinating betting trends. A spokesperson for the bookie said: “Long Run is surprisingly weak, given his outstanding form credentials in the race. In fact, he is now a bigger price than before Imperial Commander’s injury ruled him out of the race. This is another horse going for Gold Cup glory in 2013 of course, two years on from winning the race for Henderson. With the absence of several high-profile horses, this is probably going to be the most experienced horse in the field. First things first though, Long Run will be going for glory in the Betfair Chase, making the most of Imperial Commander’s absence. The biggest challenge to the pre-race favourite is likely to come from either Slivinicao Conti or Weird Al. Before this race gets underway, make sure you stop by www.poker.co.uk, a great place for strategy and advice on poker / gambling.